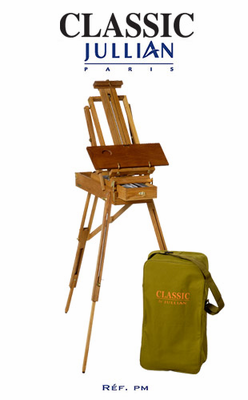 MADISON ART SHOP is the only source worldwide for this JULLIAN PARIS Classic PM French Easel made in Jullian's original Paris, France factory. JULLIAN PARIS Classic PM French Easel - HALF Size - Manufactured in Original Paris France Factory! (Closeout) We have a limited quantity of stock left of these easels made in the original Legendary Jullian FRANCE factory! Only Half-French Easel size left. Weight: 5.5 kg / 12.13 lbs. Handcrafted Elmwood. Drawer depth is higher than others. A line of French easels designed by Jullian with a very attractive price! A Madison Art USA Exclusive - Available Now! Wait a number of years and it may be worth a fortune. An original Apple computer just sold for $200,000! You never know - maybe keep it in the box - or enjoy it now!